While every day is one to express gratitude, Thanksgiving Weekend is a special time to celebrate abundance. 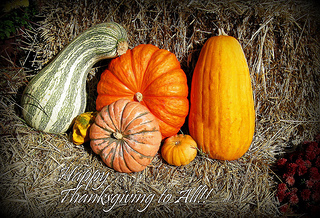 It’s traditionally a time of giving thanks for the harvest and the blessings of the preceding year. Today marks the beginning of Thanksgiving Weekend in Canada, a time to gather with family and friends and celebrate our bounty. The subject of our gratitude need not be grandiose—our circumstances are all different. Expressing gratitude for even the simplest things amplifies positive energy and spreads goodwill. Support network. I’ve always known that the world is full of wonderful people, but never has it hit home as much as in the past six weeks. The outpouring of support, offers of help, places to stay, meals, transportation, and healing energy has been humbling. So many people have been paying it forward, I’m going to need a lot of time to do my share. Health care. We gripe about health care on both sides of the border, and granted there’s much room for improvement with both systems, but we’re far better off than most of the world. I’ve been tended to by expert practitioners, from surgeons and nurses to rehabilitation specialists. Can’t imagine where we’d be without them. Seasons. Autumn is one of my favorite seasons. (The others are winter, spring, and summer.) This year I’ve had the opportunity to experience the changing prairie landscape and brilliant, showy colors from the boreal forests that flank Lake Superior’s northern and eastern shorelines. As the season has progressed, the colors have moved south to my neighborhood in southern Ontario. Beautiful! Mobility. I may not have much use of my left arm yet and still have limitations with my right hand, but both legs work just fine. I can get around pretty easily. It’s allowed me to make a choice to go carless, and gain a whole new perspective on transportation choices and simplifying in all areas of life. Living quarters. Having to search for new living space at this time was one of the furthest things from my mind. Within two weeks of arriving back in town, I found a lovely new place and have already moved in. Piles of boxes are still stacked in hallways and corners, but it’s organized enough that I can bring Measha to her new home on Monday. Health. I’m tremendously grateful for a vibrant and healthy body, mind, and spirit. They’ve taken a hit to be sure, but were it not for my otherwise robust state of health, recovery would be a more difficult and prolonged process. I’m doing everything in my power to care for myself, so that I can return to my previous level of activities—and more—that much sooner. Time. I expected to be on the road at this time, somewhere in the US southwest, traveling, exploring, and learning. Even before my accident, it was obvious that I’d set too aggressive a timeline for what I’d envisioned accomplishing. Scaling back on writing didn’t leave enough time. Now I’ve got the winter to recover, reassess my strategy, plans, resources, and timelines and figure out how I best fulfill my goals. And be open to destiny. As I review my list, I realize that although the context is different this year from any other, there are always reasons to celebrate abundance. Apply this list to your situation and watch it work for you. Thank you – beautifully written Liz. It was a wonderful reminder about how many things there are for which we should be grateful. There’s always something, even when the road gets rough. Thanks Nancy.